Want to avoid crippling garage bills? As a DIY mechanic you could beat the system. rears finally gave out (They were worn out! ), so we have to replace them. so using the handbrake and leaving the car in gear won't stop it from rolling away! Take extra care and use wheel chocks! even when it comes to brakes, yes. (model & year model etc). (at the same time, yes)! There are several brands to choose from. 4) Next remove the rear pad. It is on the other side of the rotor. 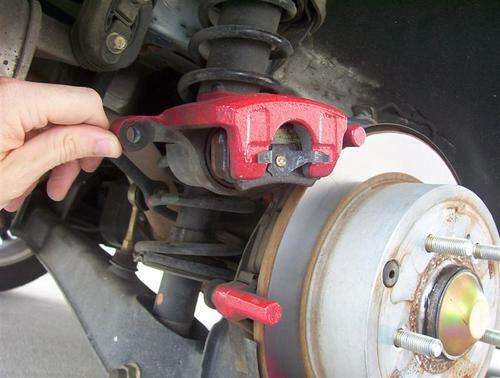 5) Next take the "brake separator" and place it like it is in the picture. Slowly depress the piston until it is flush (until you cannot turn it anymore). Make SURE you do this SLOWLY! 6) Take the clips and plates that are on your old pads and put them as they were onto your new pads. 7) Then just put everything back together and do the next side.